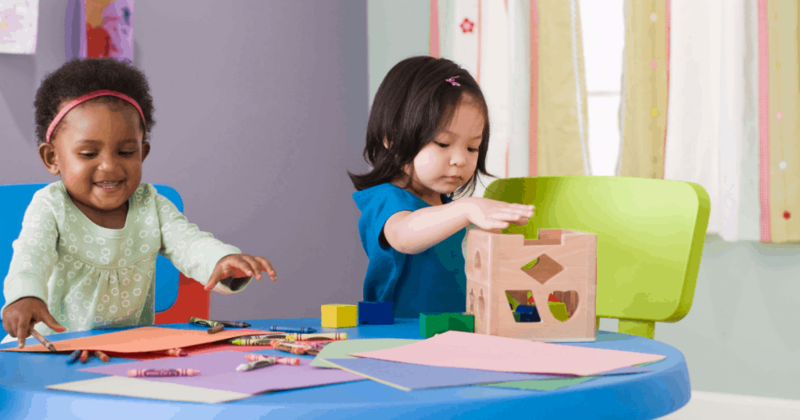 Toddlers are extremely curious and busy little people, it is very important to help them grow and learn by providing fun educational activities you can do at home. 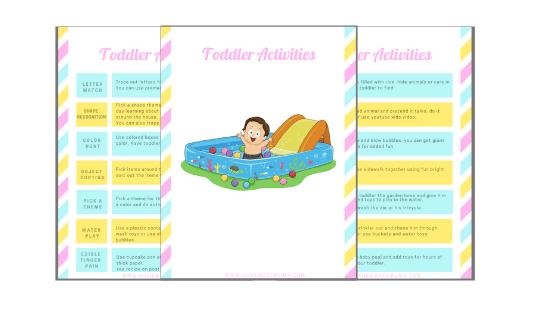 Here is a list of wonderful activities you can do with your toddler that promote learning at the same time. If your toddler is anything like mine and I’m sure he is then you know as well as I do that a toddler that isn’t into his toys will be into everything else because of their curious nature and hunger for exploring new things. One of the most dreaded things is the silence that follows your toddler getting into something they shouldn’t be doing, it is never good to hear this silence unless he is napping. I’m sure this has happened to you at one point or another and you found your little one into coloring on the walls or something else lol. 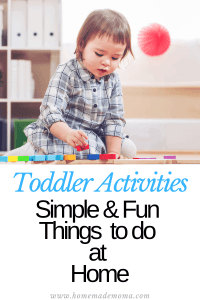 Here is a great list of fun toddler activities you can do at home indoors or outdoors and it will keep your toddler out of trouble and doing something educational at the same time. It is so important to provide these educational activities for them as they grow and develop into the wonderful people we want them to be. You can do these activities using items you already have at home and be creative with it. You don’t have to follow these exact activities just use whatever you have on hand. Using a piece of paper trace out letter either by hand or using magnetic letters for the refrigerator, the purpose of this activity is to get your toddler to learn letter recognition and be able to match them up. You can color them each a different color to make the activity more enticing to your toddler. 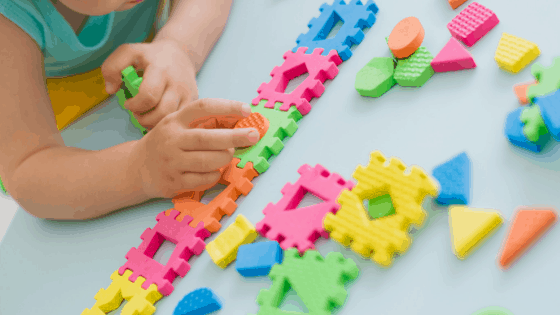 This is very similar to the first activity, draw or trace out different shapes and either cut out pieces to match or use a toy they have with different shapes. This will help your little one recognize and match up shapes. You can use colors to help them match them up so they can learn colors and shapes at the same time. Another fun thing you can do that will also make food more fun is to make cookies and cut them into different shapes or cut sandwiches into squares, triangles, stars and any other shape you want. This activity can help you feed a picky eater at the same time. A great way to get your little one to learn shapes is to spend a day with a certain shape theme and do activities around it all day! Go for a walk around the house and find the shape in each room. Using colored construction paper, lay it on the floor and have your toddler look for toys that match those colors. These can be items you have around the house like straws, pom poms, or anything else that is colorful. Toddlers love doing these kinds of games, it is very similar to doing a scavenger hunt! You can make it more fun by hiding the different colored items around the house and having your toddler search for them. If you have some boxes or colored buckets (wrap it in wrapping paper if you have any that matches) you can place items of the same color in the box or bucket and have your toddler find the boxes and talk about those items and the color. You can have them sort them out afterword by placing all objects in a pile and having them place them in the right colored box or bucket. Gather up a bunch of items like spoons, trucks, cars, cat stuffed animals and have your toddler sort out the items that are the same. You can also take it a step further and have your child match up socks of different colors. This is great for helping your little one recognize what objects are the same and what ones are different. This is a great indoor or outdoor activity if the weather is permitting. 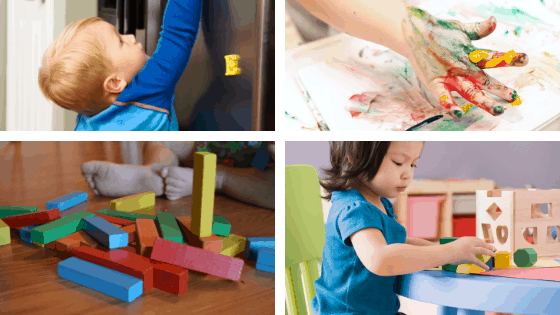 A great way to teach your toddler is to pick a theme for the day and do activities around that theme, for example, if you pick a color do things all day that have to do with the color. Say you pick the color red, eat food that is red, put on red clothes and talk about items that are red that you have around the house or see outside. 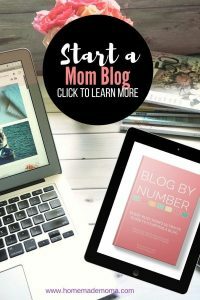 You can do this with any theme even animals or your child’s name and it helps them learn better if you talk about it all day and do fun activities surrounding it. This is similar to what they do in daycare and preschool and it has worked well for toddlers in my experience. If your feeling more ambitious pick a theme for the week like the zoo and spend the whole week focusing on different aspects of it and at the end go to the zoo with your child and see how much they remember from the activities you did all week! This is a great way to see if what you are doing is working or if you need to change your strategy a bit. Give your child items that they can use to pour water into different sized containers, you can do this at your kitchen sink, bathroom sink or in the bathtub as a fun activity that helps with fine motor skills. You can also use shaving cream and even some food coloring if you like, which is a great activity for sensory learning. You can also give them items to wash such as cars or farm animals, fill a sink with soap and have a container with plain water and have them wash each item and dry it off. This is a great activity that will help your child understand dirty and clean and also expand their vocabulary if they don’t know these words already. You can make edible finger paint and place the different colors into bowls or use a cupcake pan and have your toddler paint on paper. This is perfect for kids to get creative and not worry about them trying to eat the paint. Making this paint is also a great activity for you to do with your toddler. Painting promotes fine motor skills, hand-eye coordination, cause and effect, language skills and discovering new textures which are good for sensory development. Take a saucepan and mix corn starch with a little bit of cold water so that it makes a paste. Pour in 1 Cup of boiling water and mix till you don’t have any lumps. Turn on heat to medium and stir till you see the liquid change a bit and clear streaks will appear. Turn off the heat and continue to mix until it thickens into a pudding-like consistency. Pour into containers like glass mason jars or some kind of sealed container. Add food coloring and mix until combined, about 2 to 3 drops of color works well in each. You can store this in the refrigerator for up to two weeks, make sure to double check that it isn’t expired before giving it to your child. To do this activity take a clear bin that you use for storage or you can buy one from the dollar store and add in cereal or rice. You can have your child use scoops or construction vehicles or even hide letters in the box and have them tell you what it is when they find it. This is perfect for hand-eye coordination and sensory development and provides hours of fun for your toddler. I’m sure you have heard of this game or played it as a child as I did, this is one of the best games that help teach your child to listen and follow directions. Super easy game that you can use a stuffed animal and pretend it talks, do it yourself or look up Simon says on YouTube kids and both of you follow the video together. I know they have it on sesame street as well if that works better for you ( Elmo seems to be the one my son follows with this game way more then me ). If your child will follow you, you can do the game freeze dance and dance to music until you stop the music and freeze. This works great for increasing language skills and getting your toddler to listen better. Here is a list of outdoor activities we like to do with our toddler when the weather is nice enough to go out and play. The weather here right now isn’t ideal for going outside, just a rainy cold mess. A simple way to work on your child’s fine motor skills is to have him blow bubbles and get all excited about popping them or watching them blow in the wind. We do this activity for at least an hour every time we are outside and my son loves it. This is one of the simplest activities you can do at home that doesn’t require any prep at all and you can make it into a super fun activity by getting the giant bubble kits and experimenting with the gigantic bubbles together. These also work great for birthday party’s and will keep the kids occupied for hours! Get a cheap bucket of multicolor chalk and go outside to paint the sidewalk with beautiful artwork. We always have some of this on hand for those artist occasions that my son wants to go out and color our driveway when he is bored with doing other things, it’s always a great way to entertain and help him use his creativity and fine motor skills. Crayola makes some really cute and fun chalk, one that looks like a crayon box with every color you can think of and also glitter chalk sticks for your little one that needs some sparkle in her life! When it’s warm enough to be wet outside hook up the garden hose with the sprayer and let your little one explore with buckets and toys he can wash and puddles he can have fun splashing in. This is a great sensory activity and also helps with creativity and imagination. Our son will do this for hours on end in the summer and it never gets old, he will even go as far as to spray us with the hose at the highest setting because he thinks it is hilarious!! Give your toddler the garden hose and see what new things he comes up with. You can teach him how to wash his cars or tricycle with the hose and a bucket or even your car if you dare. It’s always a fun activity for your little one to play in the sprinkler and let that energy out, this provides endless hours of fun and will keep your toddlers attention for a while. This is great for having friends over on a hot day and keeps them busy chasing each other around. Most kids love the water so getting them to play in it won’t be hard to do, add a few toys like buckets or balls that are soft and squishy or even water toys. If you don’t have one of these you should get one, they are reasonably priced and sold just about anywhere. This is a great activity to promote motor skills and keep your little one busy in the water while staying cool. We do this often in the summer and our toddler loves getting out his water toys and even some that aren’t water toys ( cars and trucks that we have all over the place ) and splashes around washing his cars and filling up buckets of water to pour out on himself or into another container. You might even find yourself sitting in the water with him because it’s so hot out and your little one wants you to come join the fun! 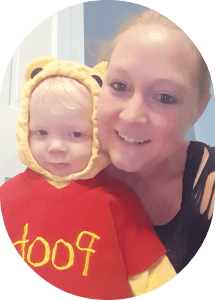 There are a ton of ways to keep your toddler busy, you are the only one that knows what they really like doing and what is frustrating, pick something you both will enjoy doing and watch their creativity come alive. Toddlers are fascinating little people, they don’t follow the same rules as adults and no logic is involved, yet they will blossom and grow with a little creativity and items you have around your house already.